Universal indicators can use different input signals. Universal indicators display any physical magnitude through a normalized current or voltage signal. Universal indicators are the ideal instruments to be used in diverse measured points or when sensors must be replaced after some time. Universal indicators available at PCE Instruments can process both current signals of 4-20 mA and voltage signals of 0-10 V. Universal indicators can also be connected to resistance thermometers (Pt100, Pt1000), thermo-elements and resistances. 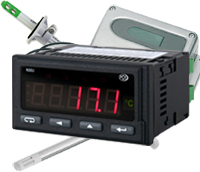 Universal indicators have a wide range of applications due to the fact that they can be freely scaled so they can be used as for instance: temperature control, noise level control, etc... Some universal indicators allow to process programmed alarm limits overall in the control of critical parameters. Through an alarm relay, a visual signal can be activated or even a machine can be deactivated. if you have any doubt regarding our universal indicators, call us on UK customers +44(0) 23 809 870 30 / US customers (561) 320-9162 and our technical staff will be pleased to help you regarding universal indicators and the rest of measuring instruments and scales available at PCE-Instruments. Universal indi cators are used for companies to display measured values. These universal indicators have a built-in free scale current or voltage input. This means that the user is able to connect universal indicators to diverse universal sensors with different output signals. Thanks to the universal indicators free-programming, users can select the relation between the magnitude and the output signal of the sensor or transducer. 2 points linear sensors are enough for this scale type. For example, a humidity transducer with a output signal of 4 mA and a humidity in air of 0 %, or a signal of 20 mA and a humidity of 100 %, universal indicators can process these signals and display air humidity. If you wish to print a selection of Universal indicators from our catalogue, please click the PDF symbol.